This Friday is the start of Chinese New Year, and 2014 is the Year of the Horse. The energy of the horse is something I've often called upon in spells, magic and rituals when a job needs to be done and things need to get moving in my life. Horses symbolise strength, hard work and fast travel in both English traditions and in Chinese astrology. In Your Chinese Horoscope 2014: What the year of the horse holds in store for you, author Neil Somerville says: "Whether pulling a cart, working on a farm, being ridden for pleasure or sport or displaying the graceful skills of dressage, the horse is a good worker. And has many styles. Many of these qualities will be evident during the Year of the Horse. "The Horse enjoys activity and a prominent feature of the Horse year is that it favours action. Whether on the world stage or in the arts, media, technology, medicine, or other spheres there will be significant developments this year and the emphasis will be on innovation and pushing the boundaries." As I posted earlier today, I am facing a time of change - with my husband out of work and searching for a new job. Hopefully, the Year of the Horse will be good for all those people in a similar position. May we all find what we need in the year ahead, with the energy of the horse to help us. 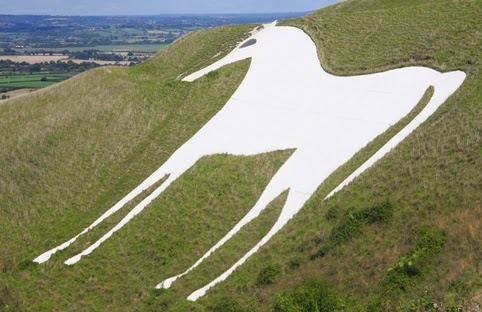 The photo above shows the Westbury White Horse, in Wiltshire, England. Thank you. I think its the Wood Horse. I am on the cusp of the Snake and Dragon. Here's a good Thai site, but have your pop up blocker on and for me Firefox browser does that automatically. Blessings.